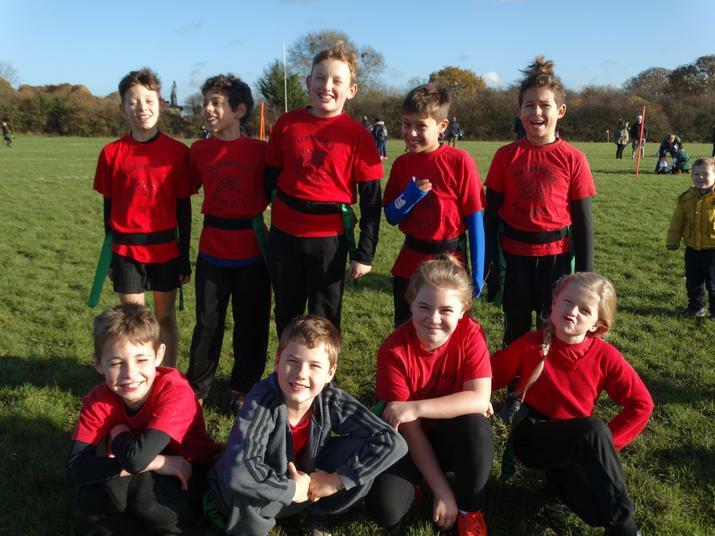 In November 2018, four teams from Hereward competed in the 'family' Tag-Rugby Competition at Debden Park High School. All the teams worked hard and played to the best of their ability. The 'A' team qualified for the partnership finals by finishing 4th out of seven teams. The 'B' team won half of their games and finished 5th - the 'C' team performed even better winning all but one of their games and finishes runners-up. Finally, the 'D' team finished 3rd. Later on that month, the 'A' and 'C' teams participated in the West Essex Schools Partnership finals at the Metropolitan Police Grounds in Chigwell. The 'A' team competed in the cup competition against the winners of the other family competitions. The team played extremely well and won 5 of their 7 games! They drew against the eventual overall winners which was also a great feat. Not to be outdone, the 'C' team competed in the plate competition and also only lost 1 game all day. They finished in 'bronze' position and wore their medals with great pride. Congratulations to all of the children who took part who were a true credit to themselves and the school.